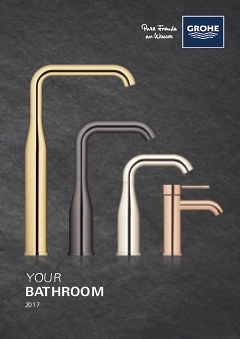 GROHE sets the standard. Especially with this GROHE New Tempesta 100 mm hand shower with choice between three spray patterns ~ the GROHE Rain summer rains, the gentle Rain O² with added air or pulsating Massage spray. GROHE DreamSpray ensures that the water is distributed evenly to all spray nozzles. And enjoying and being environmentally conscious go well together. That is why we developed GROHE EcoJoy, which maximizes consumption at 9.6 L / min . Good for the environment and for your wallet. The shower head is equipped with the ShockProof protective ring. So in case the shower head slips from your hands, the shower, tub and tiles are well-protected. It's also nice to see. The GROHE StarLight chrome coating gives a beautiful shine and is very easy to maintain.